I find one of the most sentimental things about recipes that are passed down through generations is the effort it takes to interpret them. My grandmother’s recipes are often found on old computer punch cards that were used for billing at Florida Power where my Grandfather worked for many many years. She wrote on the back of them in cursive with a light pencil. Sometimes the recipe is so faint that you can’t see them and sometimes you can’t read her handwriting. Never am I annoyed by it. It allows me to spend some time thinking about her, how she would have made the recipe and sometimes the idea of if she were still around what we would talk about if we could still cook together. If only she were still here to witness the world we are living in… and were able to still make wise cracks at it (the apple never falls far from the tree). My mother’s recipes are always written on top of with multiple variations of measurements from times when she has doubled or even quintupled the recipe. It took me years to figure out what measurements to use for the Chinese Chicken Salad dressing she gave me. I always ended up making three times as much dressing than salad. 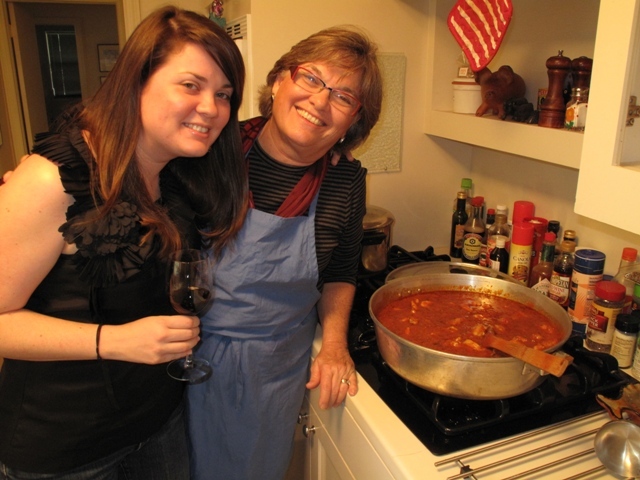 This holiday season my mother fed most of North Florida shrimp creole. She made enough to feed at least 30 people and froze parts of it for different occasions. 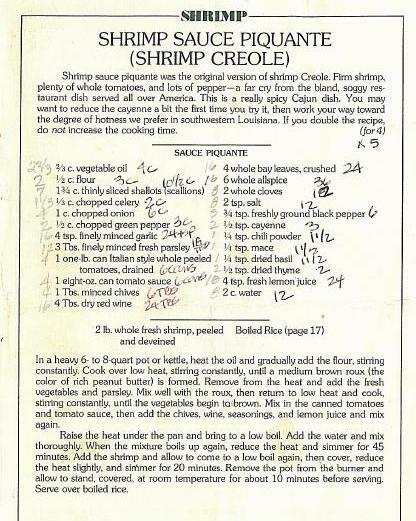 All we had to do was heat up the creole sauce, add the shrimp and make some rice on Christmas morning. It was a nice break this year and gave everyone time to visit rather than squeeze multiple butts in the kitchen. We made a grapefruit and avocado salad to serve with the shrimp creole along with some rolls. I thought my story would be most credible if I included the actual printed recipe my mother used. I highly recommend this recipe for feeding a crowd… use caution in reading the varied measurements! Hi,Terrific blogging dude! i’m Fed up with using RSS feeds and do you use twitter?so i can follow you there:D.